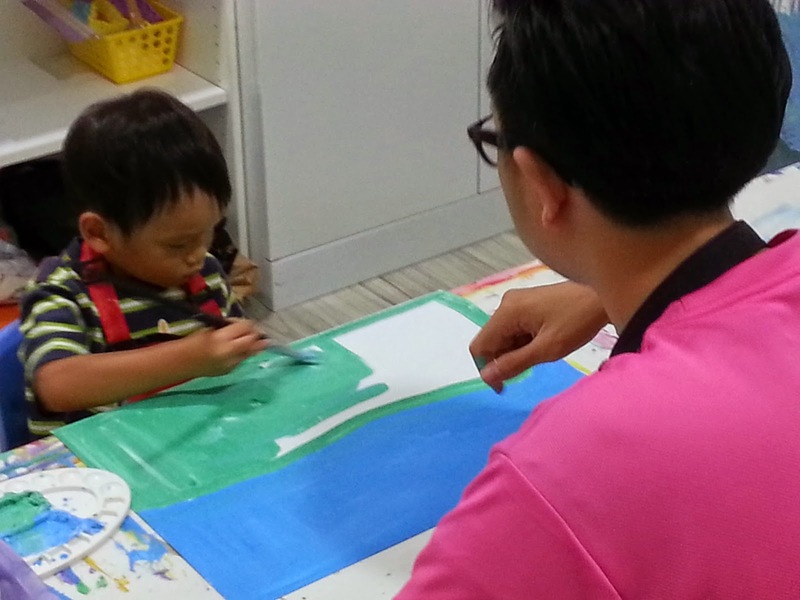 It has been quite some time since the last blog post about Z's art class. 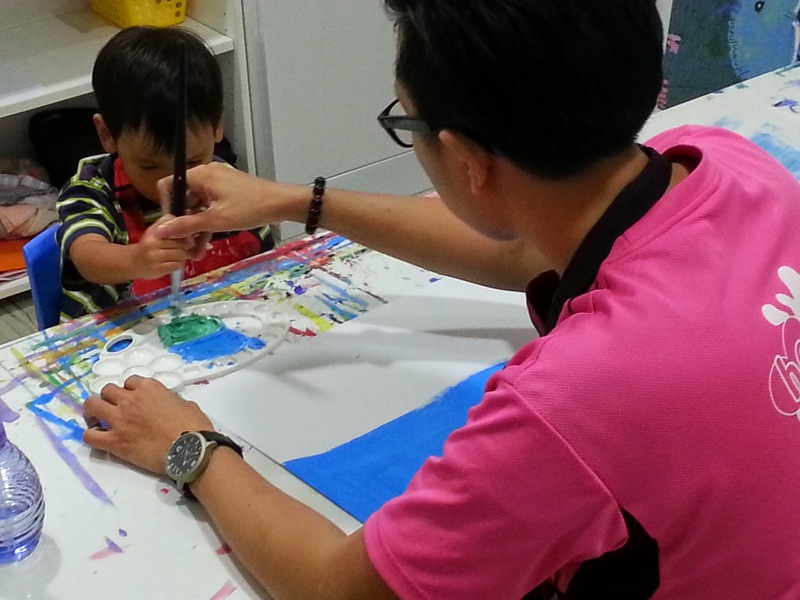 This was largely due to the studio's move to its new location at Charlton Road in Upper Serangoon as well as some restructuring in our son Z's class. 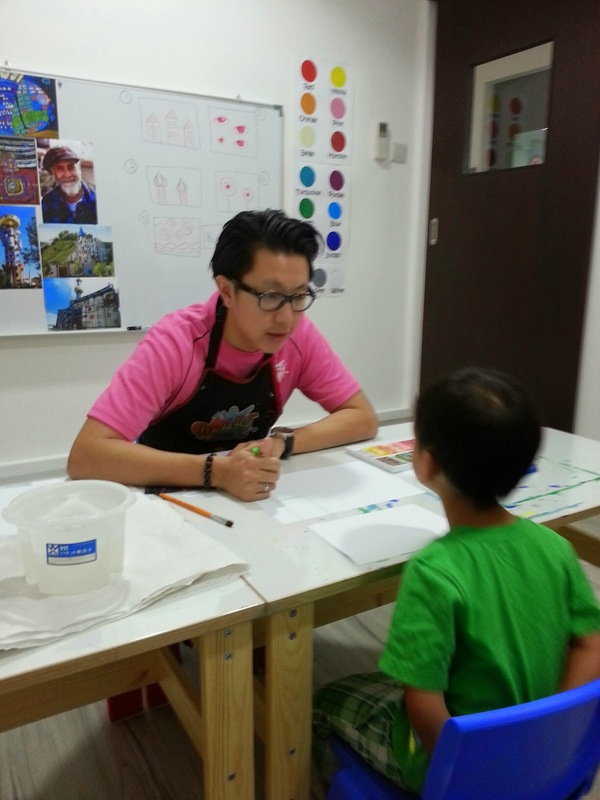 The new studio is located in a residential neighbourhood, and its quiet surroundings seem to be very conducive for students to engage in their artwork. for the development of the child. 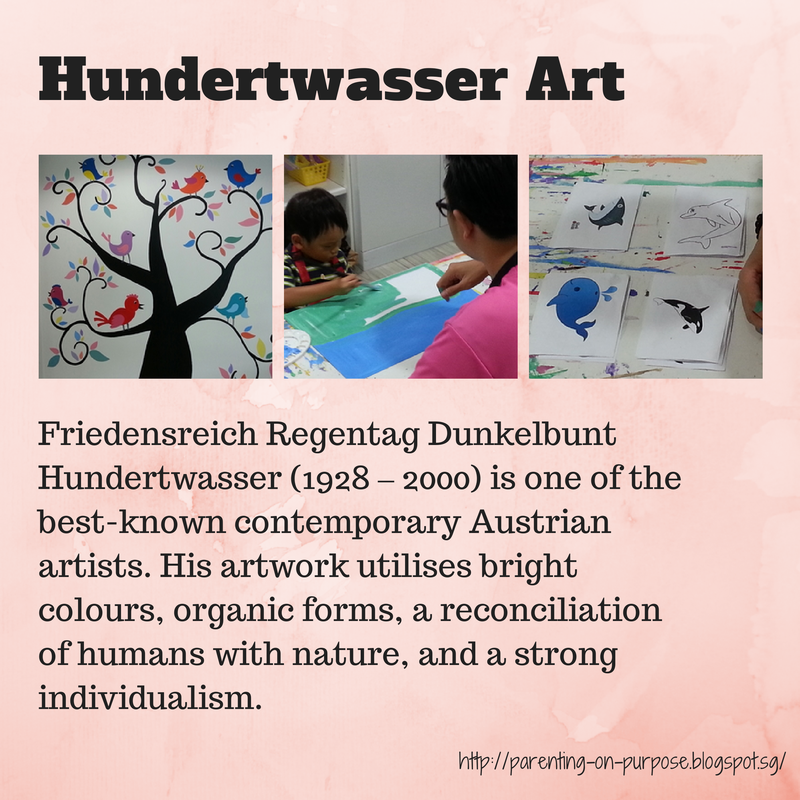 This term, heART Studio is teaching students the work of Friedensreich Hundertwasser. The artist emphasises individual creativity, and his artwork is characterised by bright colours and organic forms. At the onset of the course, the teachers introduced Z to what they termed as the "Five Treasures of Hundertwasser"; namely lollipop trees, onion domes, swirls, houses and floating eyes. 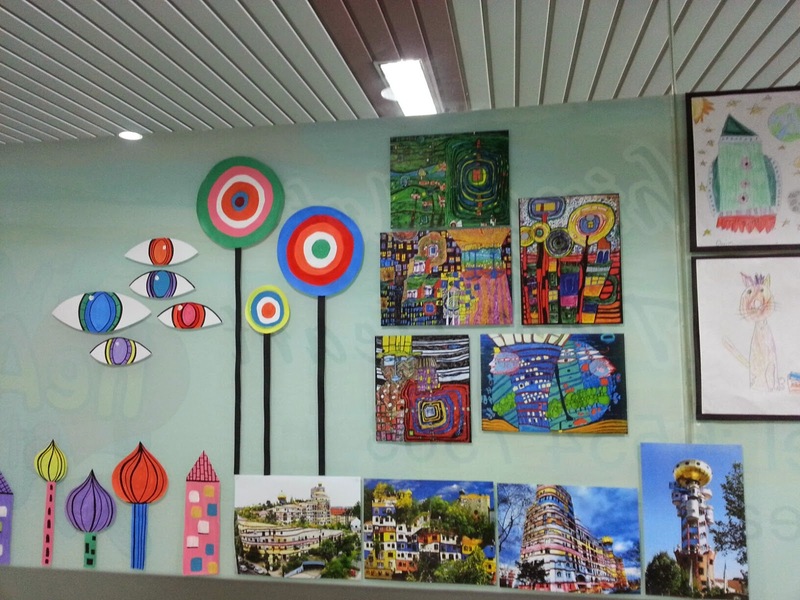 The "Five Treasures" of Hundertwasser. The first few sessions were honestly very difficult for Z. He was adjusting to the new class environment. Moreover, Z is a child who does not like too much attention and at the age of 3, is also trying to assert his individuality, which results in him not always wanting to be directed by others. We were however very encouraged by heART Studio's owner Rena, who urged us to persevere with Z, giving him his own time and space to learn and to develop. heART Studio also decided to adopt a firm yet patient approach with Z, providing him with the notion that he had to listen to his teachers, but was at the same time free to express his own creativity. Teacher JJ explains to Z patiently on the objectives for the session. 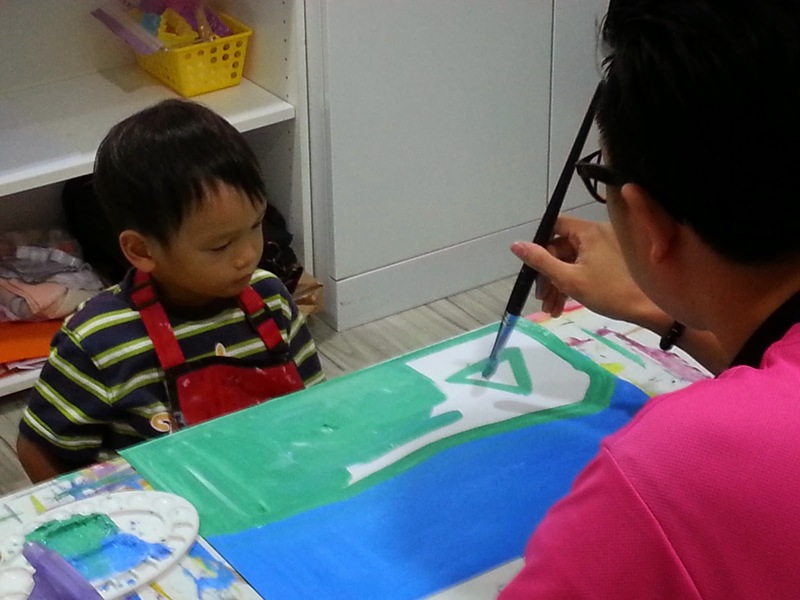 Z finally decides to paint, choosing his own colours to depict the sky and the sea. 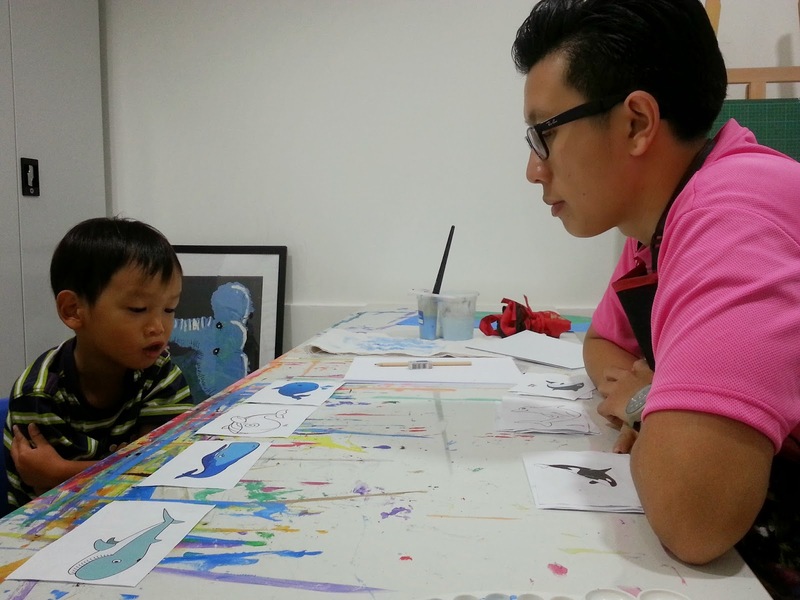 Teacher JJ creatively encourages him by making the work more fun. 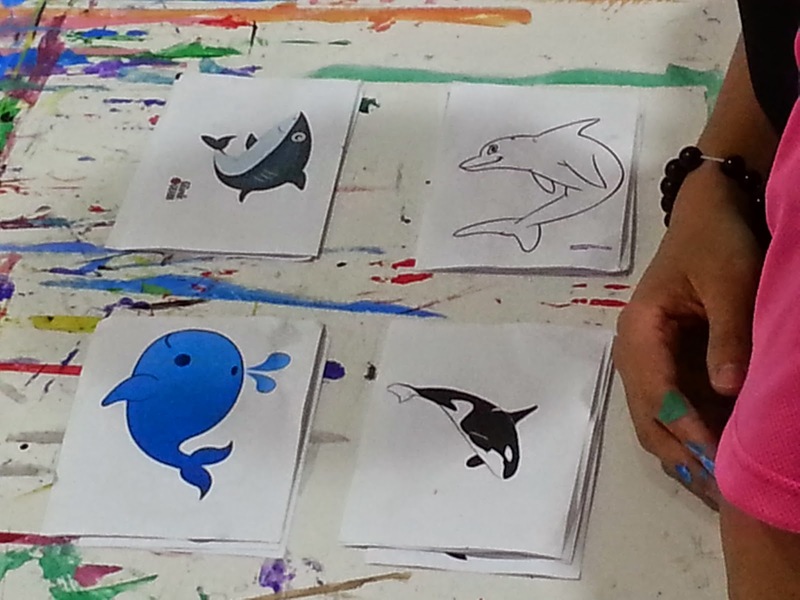 Choosing which sea creature to draw. on a whale and draws it with help from his teacher. After four classes we are finally seeing some progress with our son; from the first session in a new place where he totally refused to cooperate with the teachers, to the last class when he made his own choices as to what colours to use and what animal to draw. Learning is a journey for our children; and as parents we always want them to achieve the best. However we often forget that our expectations of them embody the end product of the journey, and we are all too anxious for them to achieve this result in the fastest possible manner. But we must remember that our children are not identical little versions of us. They possess their own unique qualities and characteristics, and while we want the best for them, our best wishes may not necessarily be the best for them. For children need to develop their best; in a way that they are comfortable with; at a pace that they are prepared to journey at. As parents we can do our best by simply standing just a few steps ahead of them, cheering them onwards with our encouragement and our love. And when we sense that the journey seems to be too difficult for them, we extend a guiding hand, in order that they will know we are on their side every time all the time. Note: This is part of a series of reviews arranged between heART Studio and Parenting on Purpose. Z attended complimentary art lessons for the purpose of writing this review. All opinions expressed here are our own. 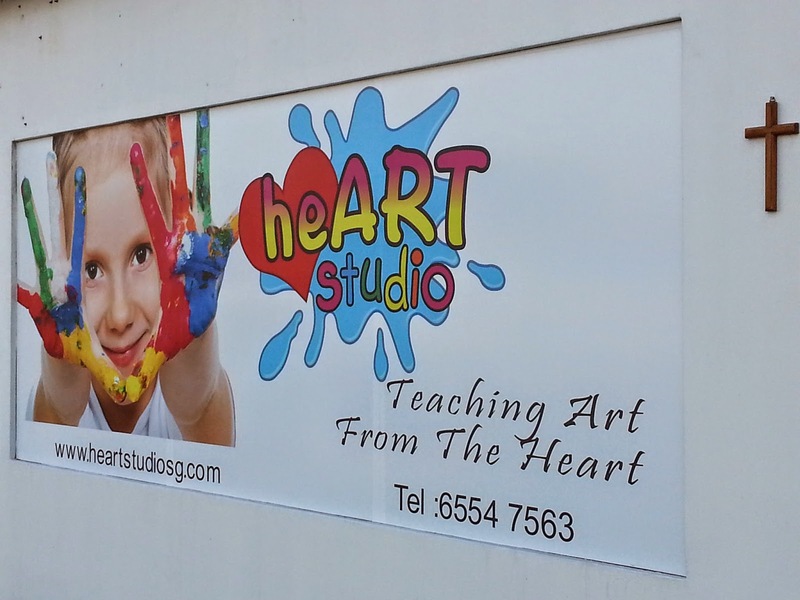 You can read Part 1 of our heART Studio review here. Part 3 of the review can be found here. For more on our post regarding the work of Hundertwasser, click here.